Weather has a funny way of botching up the best laid plans, and even in Hawaii there is no exception. It seems that Alaska has managed to send some monster swells our way to thrill and delight the surfers, but frustrate the heck out of underwater film makers! BUT, in the Microcosm there is no such thing as an idle day. The irritating waves provided a rare opportunity to make a land venture north past Kapalua (famous on the golf scene). There is nothing quite like volcanic coast, it is a miracle of nature really. On the one hand there is a display of color along the jagged cliffs that ranges from inky black to astounding red resulting from the unique volcanic material of which it was born. 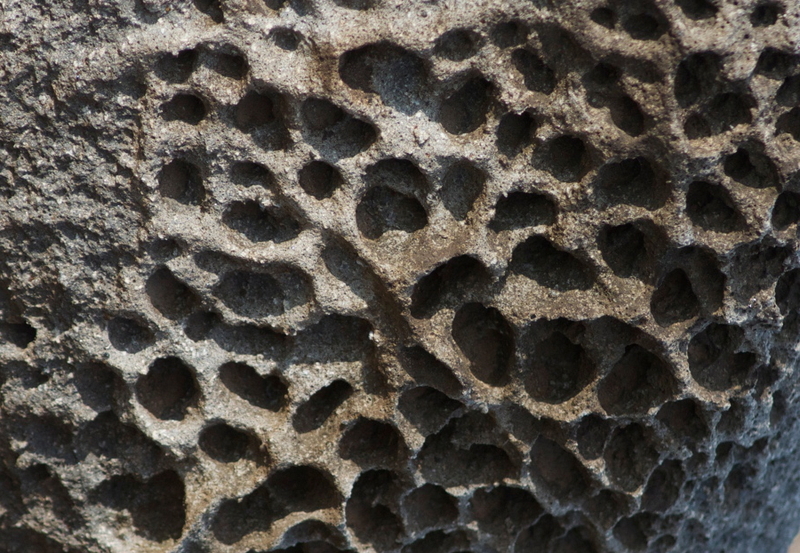 Many volcanic rocks display odd holes called vesicles that were formed as gasses escaped from rapidly cooling lava. Upon closer inspection some of those rocks have spectacular green crystals inside that geologists call olivine, but jewelers refer to as peridot. Rich green flora provides not only intriguing contrast to dark coastal features, but a bit of an enigma also. Sure there are palm trees and all sorts of vegetation to be expected in the tropics, but also varieties of pine, moss, and lichen more commonly associated with colder climates. Another fascinating aspect of volcanic coast are some of the features that occur when superheated lava comes in contact with significantly cooler water. The water takes over and sculpts the flowing material, sometimes punching holes right through it. 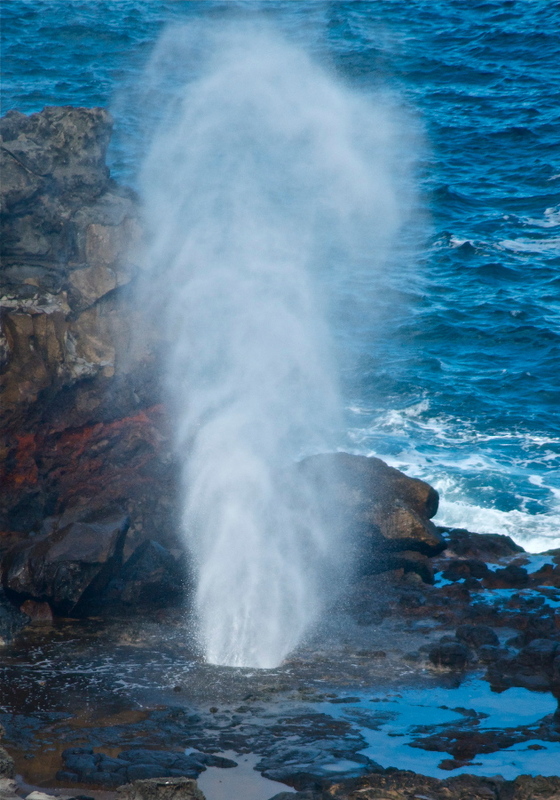 The blowhole is but one example of a complex dance between water, lava, and the forces of erosion. Though lovely to look at, they are a power to be reckoned with, and if you can’t tell that fact by looking, the warning signs all around and monuments to those who stepped a bit too close will surely bring you to your senses. To experience this place is like watching geologic time unfold before your very eyes. Volcanoes are surely one of nature’s most awesome forces, or as the seven year old member of team Microcosm commented “the way Earth farts”. Whichever interpretation your prefer, we hope you enjoyed a little background and insight into this phenomenal location. Today is manta day! Manta rays are enigmatic residents of the coral reefs around the islands. To find them we called upon Dr. Mark Deakos, better known as manta Mark. It was a commonly held belief that there is only one species of manta ray in the ocean, but in 2010 it was concluded and announced that there are in fact two distinct species. One species of manta is considered coastal, while its counterpart is a nomad of the open ocean that migrates over great distances. Manta Mark spends his time working with the fourth largest population of coastal mantas in the world off the coast of Maui. 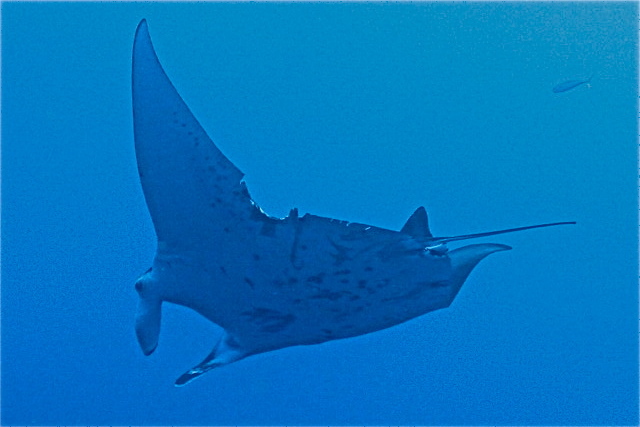 At Mark’s research site mantas come to the reef to find mates or to get cleaned. 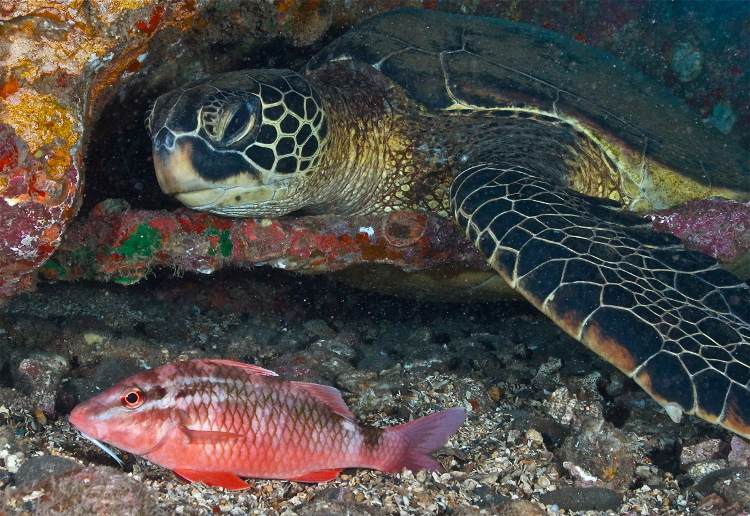 Yes, there are actually places on the reef where small fish wait for animals to come along for a cleaning. When they do, the cleaners get to work picking off dead skin and parasites, cleaning wounds and even inside the gills and mouth! Mantas are large customers and can range in size up to over 20 feet in the pelagic species. 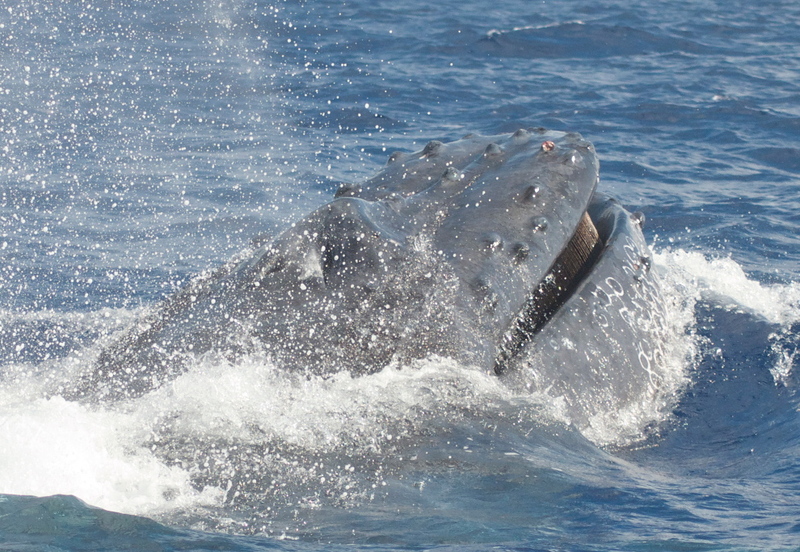 They move very gracefully in the water beating their pectoral fins like angel wings. Cephalic lobes on either side of the mouth help them channel in the plankton they feed on. 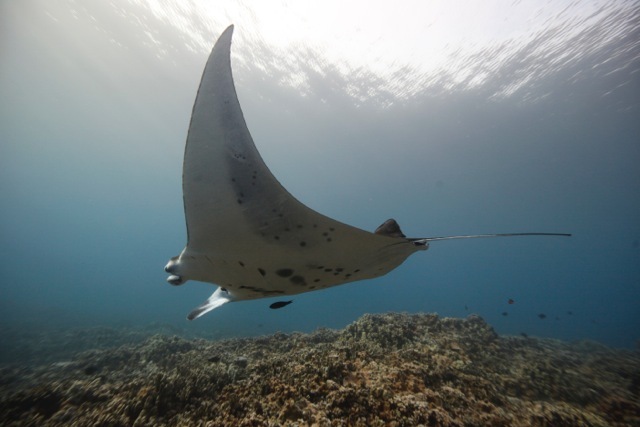 As of this writing mantas are listed as vulnerable on the IUCN red list, but with increasing interest in fishing them there is grave concern about where the population status is headed. Dr. Deakos and others like him are working quickly to collect data on these animals that will shed light on their mysterious life history so that we can take appropriate action to ensure their viability for future generations. 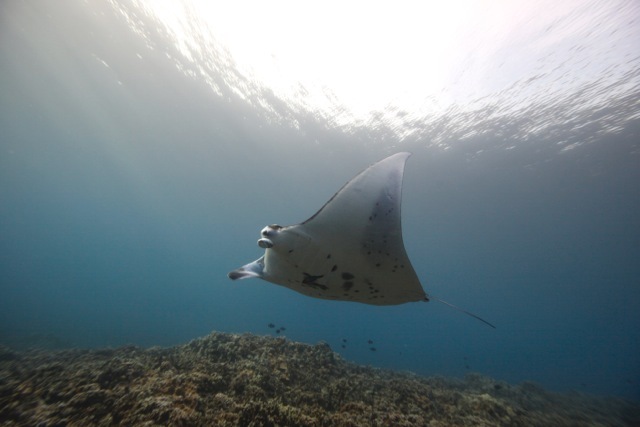 Stay tuned for ways YOU can help Manta Mark protect the mantas! Images in this section of blog are courtesy of Mark Deakos and Ed Lyman. 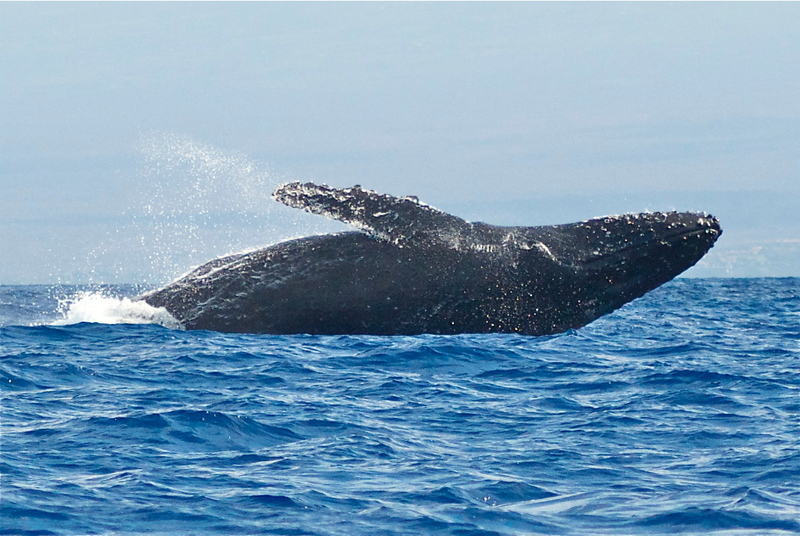 Whale season on Maui is nothing short of spectacular, and this year was even more unique. Ed Lyman of the National Oceanographic and Atmospheric Administration (“NOAA”) invited Microcosm to spend the day on board their vessel Koholā. Our goal (of course) was to bring you some amazing footage of these incredible animals from the most up close and personal perspective that we could. To say that we got close is an understatement. At times they were so close that we couldn’t even get them in the frame! There is no such thing as an ordinary business day for Ed Lyman and the crew of Koholā. Routine work involves taking photographs to document which individuals are present during a given season. They must get their photos from specific angles so that they can use coloration and markings to identify each individual. Other times Ed and his team is called upon to respond to emergencies. 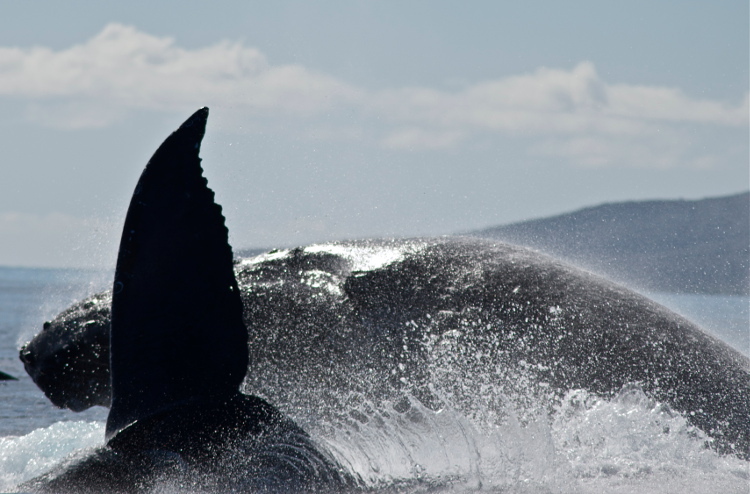 What constitutes a whale emergency? Sometimes animals get entangled in fishing nets. Such entanglement can result in drowning, deep lacerations, and other harm. Ed and his team are very experienced at removing animals from entanglement and train people around the world in best practices. Another problem is stranding. From time to time whales or dolphins come up on the beach singly or in great numbers. The reason these animals do this is not entirely clear. It may be the result of an internal condition or disease, disturbance to their sensory systems (akin to vertigo), use of certain bandwidths of sonar or a variety of other possibilities. We are very grateful to Ed and his team for the amazing opportunity they gave us not only to tag along, but to learn about humpbacks from the best of the best. So mahalo Ed & crew of Koholā! 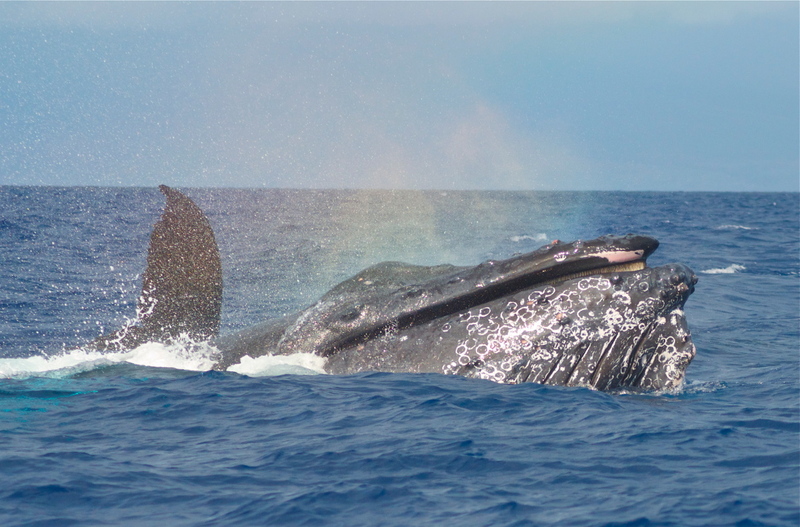 All of the images in this section of the blog were made possible by NOAA permit #15240. Aloha Blog #1 – Hawaii, ahoy! ALOHA from your friends in the Microcosm! Our departure from Chicago was tenuous to say the least as temperatures hit a record NEGATIVE FORTY DEGREES and flights were being cancelled at every turn. With only a few hours of delays, we were grateful to escape the Arctic vortex, arrive on Maui, and get the aloha started! We have hit the ground running, and in only a few days there have been meetings, whales, turtles galore, and even sharks to ice the cake! The Hawaiian islands are just about the most geographically isolated islands on Earth, and with so much distance between the islands and the next available land mass, this place has evolved a very precious ecology and a unique set of issues to go with it. Our adventure began with a meeting of the Maui Nui Marine Resource Council, a group of scientists and citizens united for better management and protection of the marine resources on Maui. You should DEFINITELY give them a “like” on Facebook! At the meeting we were able to learn about different issues impacting Maui and its surrounding waters. As more and more people flock to the Hawaiian islands, it prompts development firms to build, expand, and increase. While this is potentially fantastic for bringing in tourist dollars, in many cases the digging and excavating can spell doom for delicate coral reefs that get smothered when loose materials run into the ocean. As more wells are dug to accommodate the required water supplies, there are risks associated with materials that can get discharged into surrounding waters. Microcosm is all about building community, and spending this time with the incredible talent on the council was a real gift. And then there were whales! 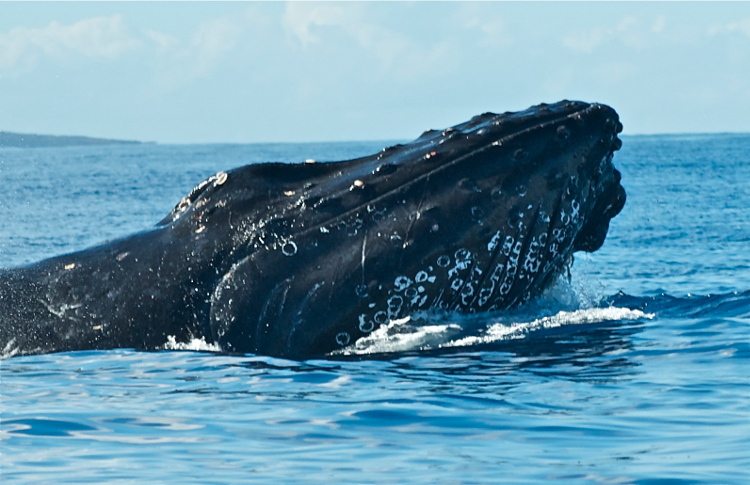 It is mating season in Hawaii and humpbacks travel thousands of miles from Alaska to give birth and find mates! 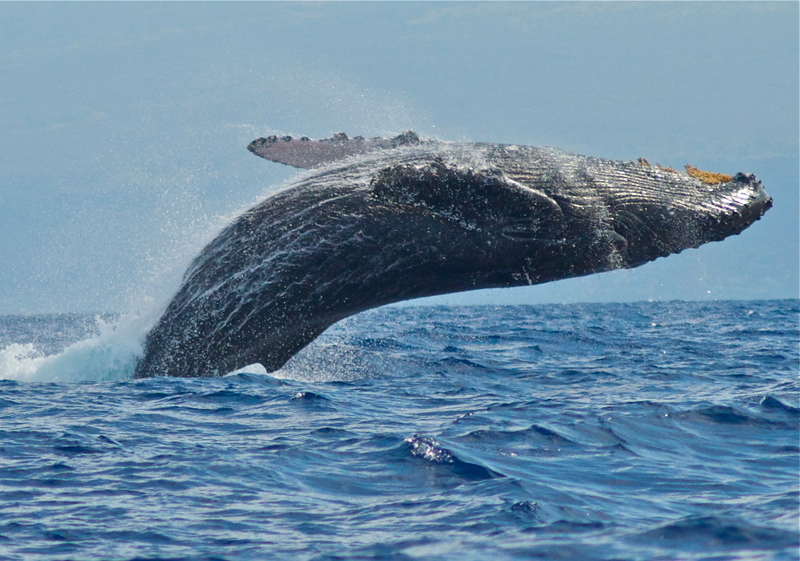 Humpbacks use their cavernous mouths to catch and consume massive quantities of microorganisms, but during their visits to Hawaii they are on a fast, and focus solely on their mating and birthing activities. The mating can get a bit brutal at times, and in this image you can see a large male throwing a full body block against a competitor who is vying for the lovely piece of tail in the lower left hand corner! 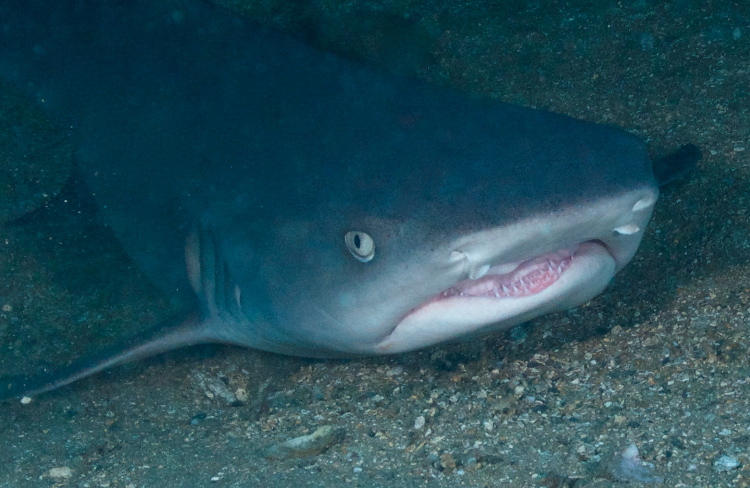 It’s time for a dive, so stay tuned for more news and updates from us folks in the Microcosm and the land of aloha!